Walking through the campuses of today’s Silicon Valley tech giants, it’s no surprise most employees are satisfied. Colorful workspaces, flexible schedules, dog-friendly offices, casual dress codes, free meals, commuter shuttles and more make for a dreamy work environment compared to the staid workplaces of America’s past. But are these efforts to boost employee satisfaction really worth it? If you ask an economist, they might shrug. Good company culture certainly makes employees more productive and engaged. But the workplace policies that drive employee satisfaction aren’t free — they are costly investments like any other. At the end of the day, the question is whether the gains of a healthy workplace culture outweigh the costs. Are efforts to improve worker satisfaction really worth the money? One way to answer that question is to compare financial performance of companies with satisfied — and less satisfied — employees. The idea is simple: If policies that boost worker satisfaction are lousy investments, it should eventually show up in companies’ bottom lines. We should be looking for a correlation between stock returns and employee satisfaction, which is precisely the subject of our most recent Glassdoor Research report “Does Company Culture Pay Off?”. 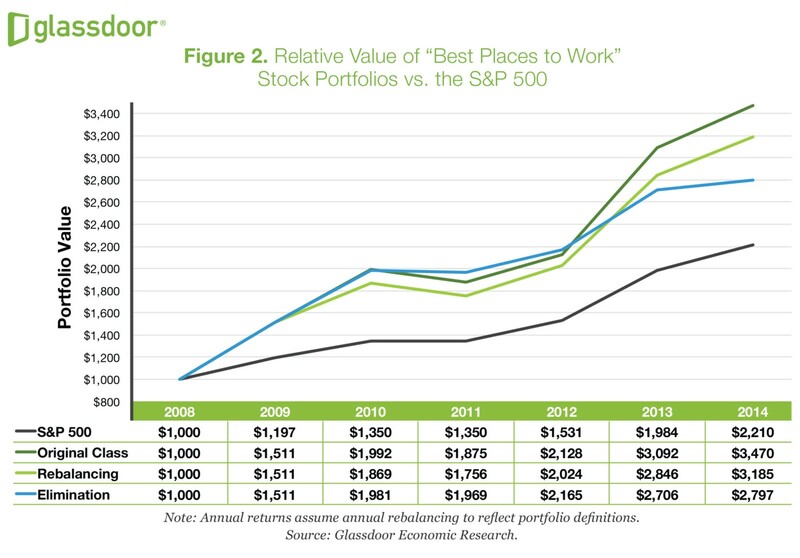 In the chart below, we look at stock returns for three portfolios of companies with very high employee satisfaction — winners of Glassdoor’s “Best Places to Work” award. With each portfolio, we imagined we had $1,000 to invest in each, and we compare their stock performance to the overall market since 2009, the first year the awards were issued. The black line shows what a $1,000 investment in the S&P 500 back in 2009 would’ve grown to today. The three colored lines show what similar investments in “happy employee” companies would’ve grown to. As is clear in the chart, an investment in Glassdoor’s “Best Places to Work” companies would’ve grown to between $2,797 and $3,470, far outpacing the $2,210 for the overall market. This is no surprise. Great companies are highly profitable, often attracting top talent and keeping them with employee-friendly policies. But does the opposite hold as well? Are companies with the unhappiest employees also poor financial performers? Surprisingly, the answer appears to be “yes.” We examined a portfolio of 30 companies with the lowest employee satisfaction as well, and found that they significantly under-performed the stock market since 2009. Ours isn’t the first study to find a correlation between healthy workplace culture and stock returns. A 2011 study by a University of Pennsylvania researcher found companies on Fortune’s “100 Best Companies to Work for in America” list far outperformed the overall market in recent years. Without a careful experimental design, it’s hard to pin down exact causes behind this correlation. One possibility is that fast-growing companies are flush with cash and have an easy time attracting and keeping happy employees. Perhaps unprofitable companies are quick to cut workplace amenities, plummeting employee morale. Or maybe fostering a satisfied workforce per se leads to higher productivity and profits. Regardless of causes, the lessons are clear. Employee satisfaction is a strong predictor of long-term company performance. That fact alone should raise eyebrows both for investors and CEOs looking for an edge in today’s marketplace.